Fully featured, premium cnc fiber laser cutting with intelligent design for the right price. Our top-tier cnc fiber laser cutters tick all the boxes, combining premium accessories, high end components, thoughtful, practical design and quality craftsmanship to deliver superb value for money. All Series One cnc fiber laser tables feature a full cabin and pallet exchanger table as standard. The first thing you will notice are the premium accessories - a full cabin, auto focus cutting head and automatic pallet exchanger. Then the outstanding specification, including power sources from IPG and fiber laser auto focus cutting heads from Raytools as well as fast, accurate motors, gearboxes and positioning systems from Atlanta, Yaskawa and PMI. Our Series One fiber laser pulls no punches, but delivers amazing value for money at just 20% more than our aggressively priced Series Two model. Enjoy peace of mind with a reliable, high production capable cnc fiber laser backed by great after sales service. IntelliCut fiber lasers deliver on the MTO promise of ‘Right Quality, Right Price’. 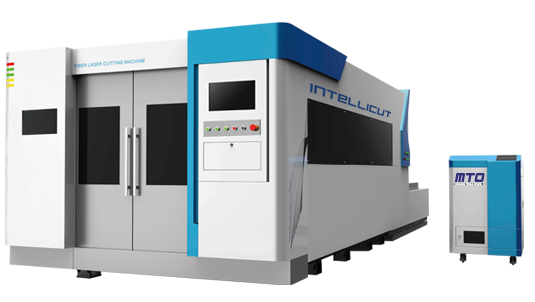 The Right Technology: IntelliCut CNC fiber lasers have years of R&D experience in small and medium-power fiber laser cutting machines invested in them, combined with advanced design, precision production and quality components. The Right Efficiency: Easy to use control for job set up, capacitive auto focus head for plate detection and height control, compact footprint and easy loading, single-axis movement speed of up to 100m/min, re-position accuracy of 0.03, position accuracy of 0.05, and single-axis acceleration of up to 1G delivers accurate, high speed, industrial level production. The Right Price: IntelliCut CNC fiber lasers stay true to the MTO promise of exceptional value for your money rather than being the cheapest on the market. Relative to our competitors, our fiber lasers offer a unique mix of both value for money when compared to high end brands, and exceptional quality and performance when compared to cheaper brands. Cabin: IntelliCut Sries One laser includes full cabin for safety and laser radiation blocking. Exchange: Only available in conjunction with cabin, to load and unload plates automatically. Cutting head: Swiss Raytools BT 240 auto focus cutting head with capacitive sensor for plate detection, height control and real time adjustment of laser output power to avoid over burn on corners. Anti-reflection optics for aluminium and brass cutting.